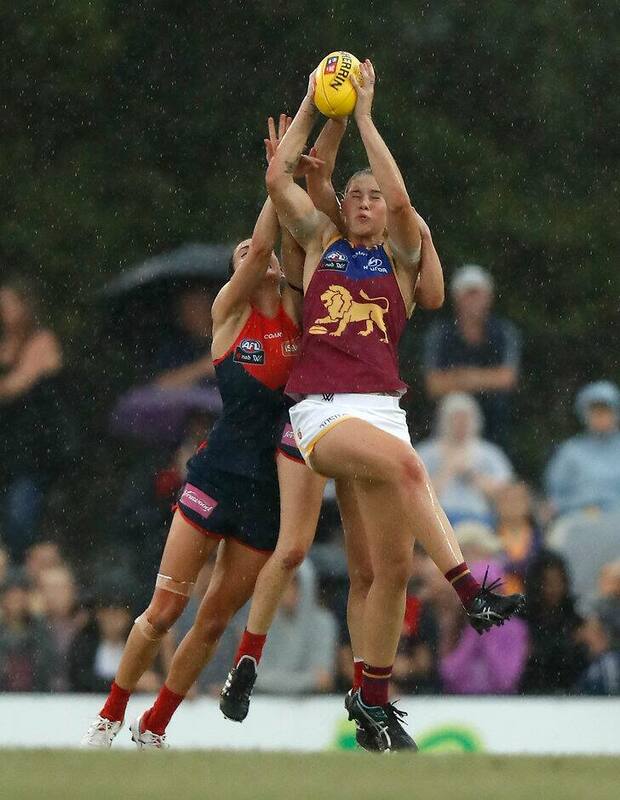 THE BRISBANE Lions have came south and conquered Melbourne in a NAB AFL Women's opening round match dogged by horrendous weather. In a game interrupted by lightning late in the second quarter, the Lions adapted better to the wet conditions to win by 15 points at Casey Fields in Cranbourne. With the game in the balance heading into the last term, Lions forward Brittany Gibson goaled from a set shot in the low-scoring slog in Melbourne's south-east. A strong northerly wind greeted players in the opening quarter and Melbourne wasted first use, managing only three behinds after captain Daisy Pearce won the toss. But heavy rain arrived late in the opening term and, although the wind dropped, the storm clouds moved in with several lightning strikes eventually forcing the game to be halted. The Lions seemed to benefit from the break, with Sabrina Frederick-Traub snapping a brilliant goal in traffic to put the Lions ahead. With heavy rain starting to fall after just five minutes of play, it was little surprise the game was a scrapfest. Brisbane soon took control of the game, holding the Demons goalless during the second half. Lions onballer Emily Bates (11 disposals, eight tackles) stood out at the stoppages, Samantha Virgo marshalled the play from the backline and Frederick-Traub presented well all day. Demons captain Daisy Pearce (19 touches, nine tackles) relished the wet conditions, with Karen Paxman also impressive. Demons forward Richelle Cranston is likely to find herself under scrutiny from the match review panel for a high bump after barrelling into Lions midfielder Jamie Stanton during the first term. Stanton left the ground in the hands of trainers with an apparent collarbone injury but returned to play out the game. With less than a goal seperating the teams late on, Gibson's straight kick gave the Lions the crucial scoreboard buffer before a 50m penalty pulled teammate Kate McCarthy to the goalline for the sealing major. Thunder and lightning prompted AFL officials to suspend play late in the second quarter. A message was sent to the field umpires to stop the game and they ordered players from the field. Jasmine Grierson had just kicked the Demons' first goal to put them in front by four points in the horrendous weather conditions. Players took an early half-time break and the game resumed with the training lights turned on after a 16-minute delay. On resumption, play continued for three minutes before the siren signalled half-time. Players simply changed ends to start the third quarter. A heavy bump by Demons forward Richelle Cranston is sure to attract video scrutiny. Cranston crashed into Lions defender Jamie Stanton who left the field cradling her right arm midway through the opening quarter. In the Demon's defence, Stanton returned the action several minutes later, seemingly none the worse for wear. But she will require scans on a sore AC joint. Melbourne will move to tighten onfield discipline after two 50m penalties cost goals. Lions forward Shannon Campbell kicked their opening goal from 40m with the strong wind at her back in the second quarter after a free kick originally in the middle of the ground. And, with the Demons pressing in the driving rain in the last quarter, they gifted another goal to Lion Kate McCarthy when a 50m penalty pulled her to the goalline. "It was pretty disappointing. In a low-scoring game, that does prove costly and we'll talk to the group about their awareness and discipline. You can't give an inch in this game," Demons coach Mick Stinear said. Legendary Melbourne premiership captain and coach Ron Barassi provided a pre-game lift for the Demons players. Barassi was introduced to captains Daisy Pearce and Emma Zielke before the coin toss in the centre of the ground. And the presence of such Demon royalty drew wild applause from the large home contingent in the 6500 crowd that pushed attendances past 50,000 for the four opening round matches of the AFLW competition.